Students of history in Year Ten cover Australian history from the end of the Second World War through to the present. Memorable moments from the course include the Whitlam Dismissal, the Petrov Affair and the Mabo Case. The year rushes along as the students approach the NSW School Certificate. Perspectives on the Vietnam War and the Iraq War. Kanakas & The Cane Fields The Red Menace? 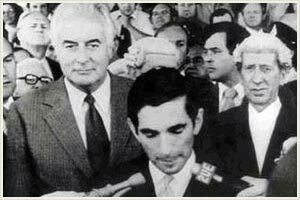 Barani ~ Indigenous History of Sydney Whitlam Dismissal Nov 11, 1975. Charles Perkins & Freedom Riders Dismissed! If you have any links to share please contact me. Please report any broken links as well.